In the above picture, you can see a candle with a pre-drilled well on the left, and a candle without a pre-drilled well on the right. 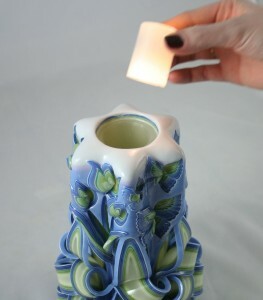 If the Pre-drilled well is selected, your candle will arrive with a well approximately 2″ – 3″ deep, perfect to accommodate either a regular votive candle, or our exclusive dual-headed LED votive candle without ever having to burn your candle. If ordering the LED kit for your candle, we strongly urge you to also select the Pre-drilled Well option, which will allow you to use your LED votive candle right away. 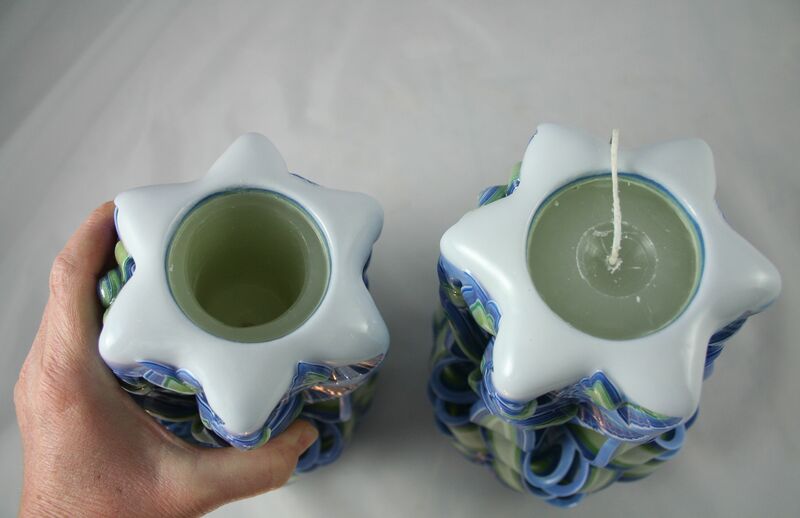 The Pre-Drilled well option is chosen as a product option when you purchase a candle from us, and it will add $5 to the price of your candle. Narrow Top candles are pre-drilled at no extra charge. *Please note: Once a candle has a pre-drilled well, the wick is gone and the actual candle cannot be lit.